Staying Warm. Do not leave your dog outside for long periods of time. Wind chill makes days colder than actual temperature readings. Be attentive to your dog’s body temperature, and limit the time outdoors. Never leave your dog or cat in a car. A car can act as a refrigerator in the winter, holding in the cold and causing your pet to freeze to death. 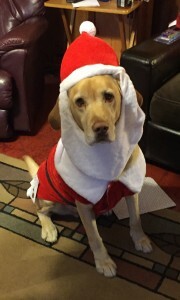 Wintertime is definitely dress-up time for dogs, when the clothing is functional rather than just adorable. Just like us, many dogs are more comfortable outside when wearing an extra layer. Smaller dogs in particular have difficulty maintaining a normal body temperature when exposed to freezing conditions. Dogs with short hair also need another layer to help keep them warm. No need for canine clothing for the arctic breeds such as Malamute, Husky, and Samoyed! Protect their Paws. Salt on sidewalks and roads, and even ice, that adheres to all of that fuzzy hair between your dog’s toes can create irritation and sores. Inspect and rinse your dog’s paws as needed. Be especially sure to clean paws of lime rock salt or calcium chloride salt, both of which can cause vomiting and diarrhea if the animal licks it. There are products that you can use for the walks around your home that are pet safe such as “Safe Paw Ice Melter”. Poison Potential. Antifreeze is terribly toxic for dogs and cats. Even a few licks of the stuff can cause kidney failure and severe neurological symptoms, usually resulting in death. Unfortunately, most antifreeze products have a sweet flavor making them appealing to dogs. Cats are too discriminating to voluntarily taste the stuff, but should they step in antifreeze, they will ingest enough to be toxic during their grooming process. Prevent your pets from having any access to antifreeze by checking under your vehicles for leaks and storing antifreeze containers in a safe place. If you think that your pet may have ingested a potentially poisonous substance, call The ASPCA Poison Control Center Hotline, at (888) 426-4435. Exercise Needs. 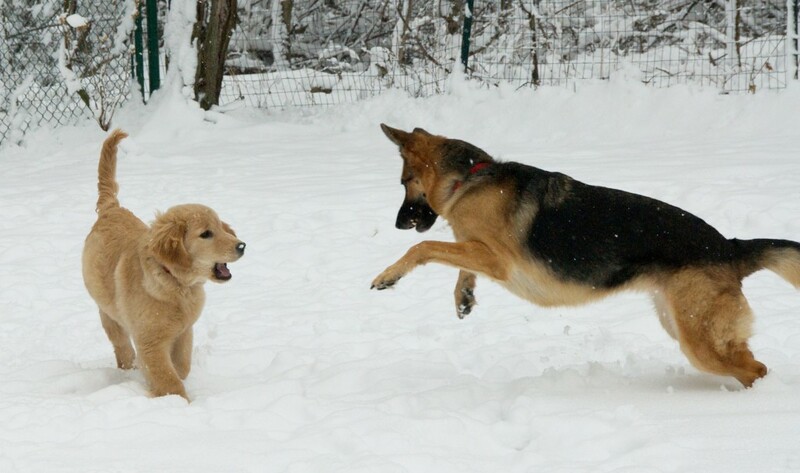 Sure the weather is cold, but your dogs still need plenty of exercise for their physical and psychological well being. A short brisk walk several times a day can be exactly what you both need. If the weather is truly too inclement for both of you to be outdoors, join a group training class, take a ride in the car, a walk through your local pet shop or consider doggie day care, assuming your dog enjoys such venues.Going for a hike with your dog down a snowy trail is great way to spend time together. However, be extra cautious around ponds and lakes for fear of thin ice. Keep your dog on leash. Your dog will not recognize the danger of walking on icy bodies of water. Not only is falling through the ice life threatening for dogs, it creates a situation that often becomes life threatening for the humans involved in the rescue operation. Protect Your Pet from Burns. Winter is the time of year when house fires are more likely to occur. Take special care to monitor wood stoves, fireplaces, space heaters and other heating sources to protect pets from being burned. Burning ambers can get into your pet’s coat, or he may be curious and touch hot surfaces. Make sure your smoke detectors have fresh batteries and include your pets when you develop a house fire evacuation plan. Do not forget to get and check Carbon dioxide monitors. Dry Skin. In winter, low humidity is common, and dogs are often kept indoors, exposed to dry heat from furnaces as well as dry environment conditions. Without enough moisture in the air, skin problems can occur. Avoid bathing your dog during cold, dry weather. Bathing removes essential oils from the skin and can increase the chance of developing flaky skin. If bathing is necessary, use a soothing oatmeal-based shampoo and follow it with a moisturizer. Brush your dog often to remove dander and any loose hair. To keep the skin full of luster, feed your pet a high quality diet. Consult your veterinarian if you want to add supplements to improve your pet’s coat. Beware of the Holidays. During the winter months we have many holidays were we tend to overindulge, eating all kinds of things we shouldn’t. 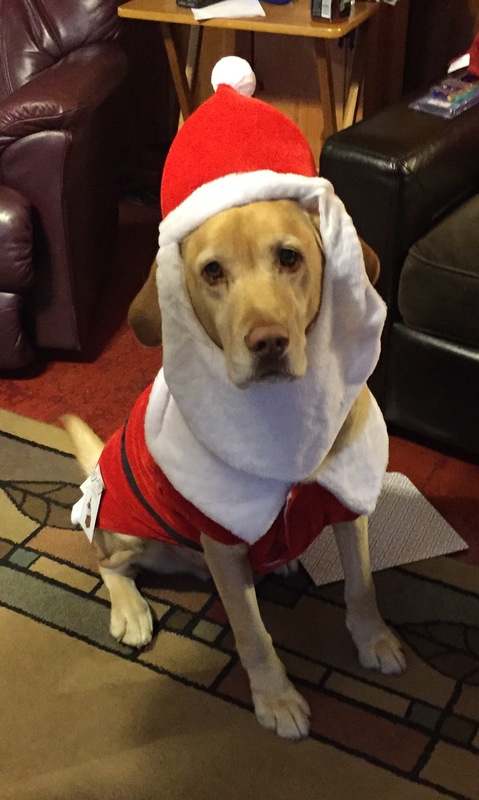 Don’t allow your pet to become a victim of this holiday spirit. Eating rich and fatty foods can create gastrointestinal upset and pancreatitis either of which could land your dog in the hospital for several days. Older Pets. Be aware of signs of stiffness in your older pets. Just as arthritis can be more problematic for us when the temperature drops, this also applies to our pets. If your best buddy appears stiff first thing in the morning or is more tentative when navigating stairs or jumping up and down off the furniture, I encourage you to contact your veterinarian. These days, there are so many beneficial treatment options for soothing arthritis discomfort. For your pet’s sake, make the effort to learn more about them. Outdoor cats. When the temperature drops, outdoor kitties like to snuggle up against car engines for extra warmth. Be sure to provide plenty of notice before you start up your engine. A “kitty squatter” can sustain serious injury as a result of moving auto parts. Tap the hood a few times, ”Knock Knock, who’s there”. Better yet, lift the hood to alert any slumbering guests that it is time to move on. Warmth and Comfort. I strongly encourage having dogs and cats live indoors. Make sure your companion animal has a warm place to sleep, off the floor and away from all drafts. A cozy dog or cat bed with a warm blanket or pillow is perfect. Your pets will weather winter better if they are healthy. An annual check up is a good idea to ensure that your pets are healthy and ready for the stresses of winter. Consider what steps you will take to keep your pets happy, healthy and safe.